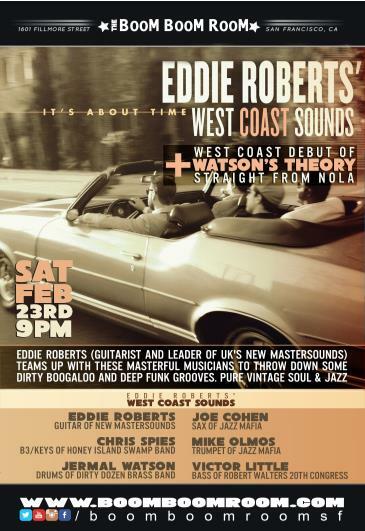 West Coast Sounds is more than simply a band name for soul jazz guitar maestro Eddie Roberts’ -it’s literally astatement about where he’s going in his extraordinary life. It’s about the Welsh native and long time Leeds, U.K. resident manifesting his talents and thriving, writing songs in his favorite city-San Francisco. The globe trotting founder of the New Mastersounds had visited many a metropolis, but he couldn’t get the City by the Bay or its hip music fans out of his head. “I realized how amazing they were, and it set an idea off,” says Roberts. “The addition of horns automatically changes the sound, although I would say that the grooves and the overall style of the West Coast Sounds is more similar to the New Mastersounds than my solo material, which has usually gone in more of a club jazz direction."